I want to know how CS-Cart handles eCheck payments. 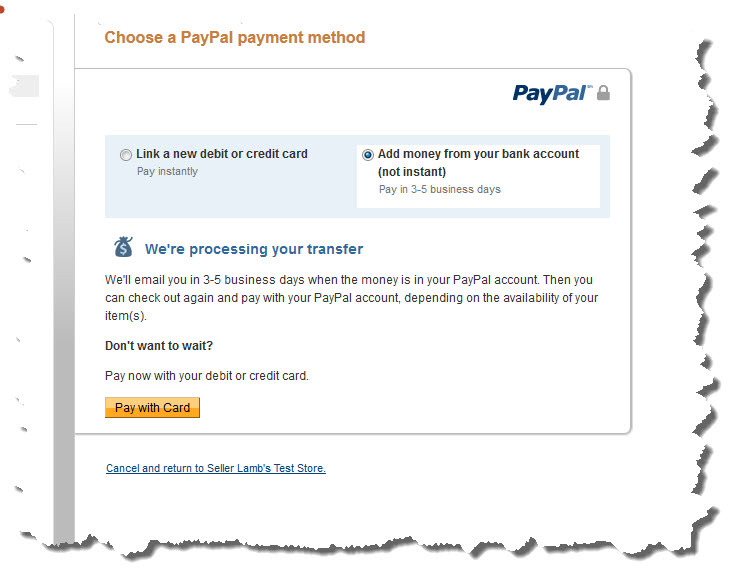 What is the status after an eCheck payment is made through PayPal Express? Is it pending or processed? Does CS-Cart automatically update the order status when the eCheck clears? I'm using the sandbox to test but I'm never given the option to send an eCheck as a form of payment. PayPal is telling me that the only way a buyer can send an eCheck payment is if they do not have a credit card linked to their PayPal account and if their PayPal account balance is not sufficient to cover the transaction amount. The only two options are to add a credit card or cancel the transaction and wait till the money is in the BUYERS account before attempting to purchase. I'm never given the opportunity to use an eCheck. I checked my sandbox seller account and it is NOT setup to block eCheck payments. Since I cannot test, I don't know how CS-Cart handles eChecks through PayPal Express. Can someone verify what the order status is when someone pays with an eCheck when using PayPal Express? Will the order status automatically update when the eCheck clears? I don't see how since IPN is not used. I put in a bug report over a year ago when my PayPal orders stayed in the OPEN status. After checking it our, it was due to the customer using e-checks. This was for PayPal standard. I don't think the order ever updated, even when the e-check cleared. Evidently, I have not had any e-check payments for over a year, so not sure what happens now. I have upgraded since I put the bug report in. It was never resolved. It does make sense that the order status is OPEN initially since you don't have the funds. I don't know about PayPal Express. I use both express and standard with no problems. I just don't get it... CS-Cart is a great product in so many ways but it does not use PayPal's IPN so I don't think there's any way for the status to update other than manually changing it when you, the seller, gets an e-mail from PayPal stating the eCheck has cleared. This is not good if you are selling mainly downloadable goods. Updating the order status should be automatic and IPN will do that and allow you do do so much more. This is why I abandoned CS-Cart in 2008. I was hoping this was resolved in v.3.x but it looks like they have no future plans of implementing IPN. CS-cart does not even use IPN with PayPal Pro! Makes no sense to me. I wish the developers would chime in here so they can explain the reason for avoiding IPN. I'm starting to feel I've wasted several days testing, fixing bugs, and tweaking this version of CS-Cart and all for nothing. I think I'm going to halt development with CS-cart and go back to hand coding the web pages and using scripts that work rock solid with PayPal since I don't have that many items to sell. If you sell downloadable items and don't mind coding your own pages, there's a better solution, unfortunately. I really want to use my CS-Cart license, darn it.